Boyeaux won the vacant French bantam title on scores of 96-94 twice and 96-93. 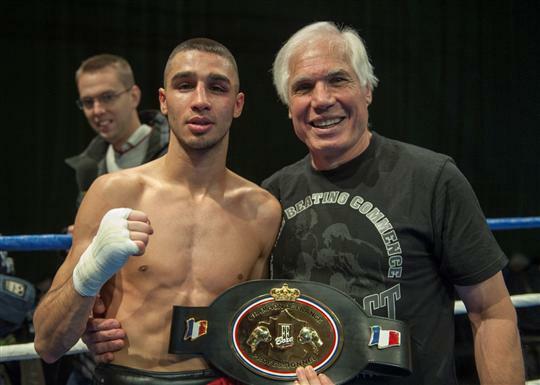 Frenois retained the EBU jr lightweight title on scores of 117-112, 117-113 and 116-112 in hardfought all-southpaw all-French clash. Toumi was down in the first but got up and outhustled Averlant for a close win in a big upset. It was scored 95-94 twice for the German and 96-93 for Averlant. This was for the vacant WBFed Int´l title. Soro won the vacant WBO Euro title on scores of 118-110 twice and 117-111. Hallab retained the WBO Euro 122 lb title with an easy stoppage of another overmatched Georgian with a bogus hometown record. Achour had Motmora on the floor twice in the first and again in the fifth before it´s stopped. Achour was down in the fourth and it was ruled as a knockdown. Morelli won the vacant WBFed, WIBA and GBU female lightweight title on scores 96-95, 97-93 and 95-95 in a minor upset. El Halabi was shot in the hand, elbow and knee by her stepfather in the dressingroom before a fight in April of 2011 but made it back.